David Kim searches for his 16-year-old daughter Margot in this mystery-drama that connects the story’s characters with audiences through a unique technological point-of-view. Filmmakers present plenty of thrills using technology without overstressing parents or relying on gratuitous content. 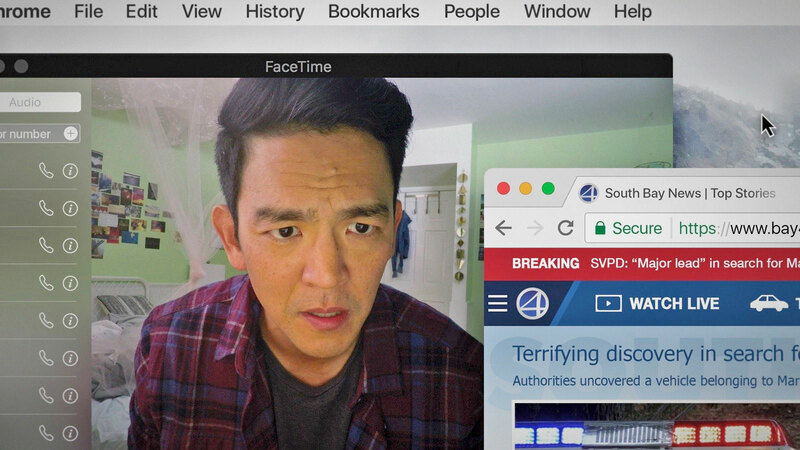 Director Aneesh Chaganty makes his feature film debut in this gripping 102-minute film, which can give anyone pause in their lives as they interact through technology. California native and former Google employee Chaganty co-wrote the quality, taut screenplay with Sev Ohanian that addresses the joys, usefulness, pitfalls, and dangers of digital communication and technology including Crowd Chase, Facebook, Facetime, Redditt, Tumblr, and Google Maps. As audiences experience Searching through the familiar viewpoint of mock computer screens, the film becomes a personalized, voyeuristic experience, which makes this film even more effective. This technique, similar to the 2014 thriller Unfriended, includes various pans and movements that focus instead of disorganize…or even make audiences a little queasy. The only chaotic (YouTube video) and disorganized (desktop icons) moments that audiences experience are very purposeful. This expert camera movement becomes a huge strength because several other computer interaction simulations in film are often flawed (out-of-focus, too fast, hard to follow, etc.). The cinematopher Juan Baron, directors of digital photography Nicholas D. Johnson and Will Merrick and their camera crew get a big commendation for their sharp and steady work. Johnson and Merrick also edit the film, which is another great decision that’s well executed as the crew truly masters the content for a quality presentation. Set in California, Searching makes a deeply emotional connection as David (John Cho) and Margot (Michele La) must overcome several personal challenges. Joseph Lee plays David’s brother Peter who needed a better establishing introduction from filmmakers, but factors into the plot well as David experiences a parent’s worst nightmare. Peter and David definitely progress their relationship through these trials and deliver the film’s best dialogue exchange near the ending climax. La equals Cho’s emotional depth, especially in the sequences where she’s interacting via video chat on her computer. Detective Rosemary Vick (Debra Messing) is a key law enforcement officer while Pamela (Sara Sohn), Peter (Joseph Lee) and Randy (Ric Sarabia) round out the supporting cast. Filmmakers bolster these strong characters with genuine moments that progress the plot and engage audiences. The beginning family background really connects without overwhelming audiences as the film hits the right tones with timing, color, visuals, and music from composer Torin Borrowdale. The mock computer screen sequences drive the audience’s sensitivity level. Familiar elements including sounds (the computer starting up), visuals (screensavers), and interactions (pulling picture files into folders). Filmmakers also use related video footage, newscasts, Amber Alert, and even a tea kettle sound to enhance this strong mystery. Filmmakers also use foreshadowing and well defined, key “crossroad” points while providing a few humorous moments that match the realism in the plot instead of simply being comic relief to help ease some audience tension. The plot also includes specific notices (e.g. “viewer discretion”) from the film’s characters that deliver key information to further boost the realism. I was able to solve this emotional mystery, but only near the end. This film definitely tests the audience’s emotional intelligence, powers of observation, logic, and analytical skills, especially in the modern social realms. Audiences will definitely discuss this film long after the ending credits and be more informed about technology, related behavior and various “red flags.” Searching might be a tough sell for repeat viewing unless you’re experiencing the film again with new viewers, but, at the minimum, it’s a required one-time viewing for everyone (in the PG-13 rating realm). Searching debuted at the Sundance Film Festival and is co-produced by Timur Bekmambetov, Messing and Cho. Highly recommended (***1/2) and rated PG-13 for thematic content, some drug and sexual references and for language. This entry was posted in 2010s Film Reviews, Film Reviews and tagged computer, Film, Michael Siebenaler, Mike Siebenaler, movies, Reviews, Searching, Tall Writer. Bookmark the permalink.